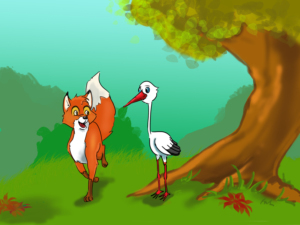 A very long time ago, Fox and Stork were good friends. 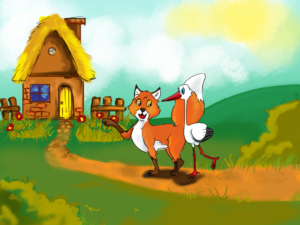 One day the Fox invited the Stork to his house to have lunch together. When the Stork arrived at the Fox’s house, the table was set for lunch. There were two bowls of soup. 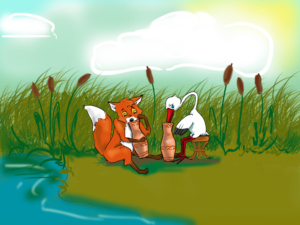 The Fox started eating, but the Stork couldn’t even taste his soup, because his beak was so long and the plate was too shallow. “Why aren’t you eating? Don’t you like my soup?” the Fox asked his guest. “It’s good, I guess I’m not very hungry”, the Stork said. He left very hungry and angry. 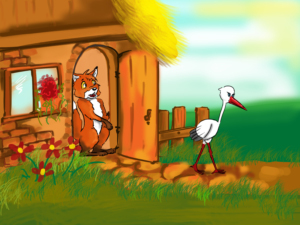 Soon the Stork invited the Fox to his home to have dinner. 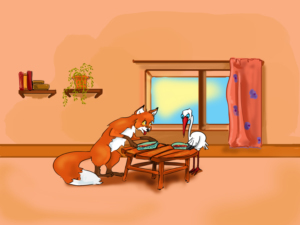 When the Fox arrived, he saw that the table was set and that two tall jugs of soup were waiting for them. “What’s the problem, Fox? Why aren’t you eating? Don’t you like my soup?” the Stork asked. But the Fox didn't reply. He was angry that the Stork served him soup in such a narrow jug that he couldn’t get his mouth in. 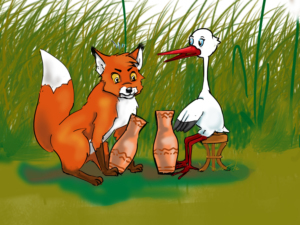 From that day on the Fox and the Stork have never been friends again.